Looking for a simpler approach? Try our Payroll Calculators - It's Free! 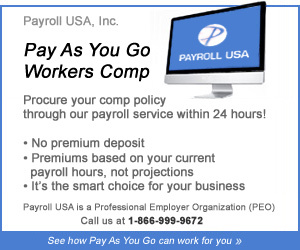 Payroll - Need Payroll with Workers Compensation? For a quick quote - no obligation, call Payroll USA (941) 756-1700. Online Payroll, with Payroll For America, provides everything you need to do your payroll online anytime, anywhere Internet access is available. We'll guide you through the entire payroll process -- from setup, paycheck calculations and W-2s, to electronic tax filing and payments. Calculate your Payroll in Minutes! Online Payroll is a payroll solution for clients to manage payroll information easily and pay employees by check or direct deposit in just three clicks. You simply go online, enter hours, preview your payroll and you're done! Employees receive email notification when they've been paid – you receive payroll peace of mind. Do a test run - Try the online sample for a fictitious company. Payroll for America in these cities and more: Montgomery AL, Juneau AK, Phoenix AZ, Little Rock AR, Sacramento CA, Denver CO, Hartford CT, Dover DE, Tallahassee FL, Atlanta GA, Honolulu HI, Boise ID, Springfield IL, Indianapolis IN, Des Moines IA, Topeka KS, Frankfort KY, Baton Rouge LA, Augusta ME, Annapolis MD, Boston MA, Lansing MI, Saint Paul MN, Jackson MS, Jefferson City MO, Helena MT, Lincoln NE, Carson City NV, Concord NH, Trenton NJ, Santa Fe NM, Albany NY, Raleigh NC, Bismarck ND, Columbus OH, Oklahoma City OK, Salem OR, Harrisburg PA, Providence RI, Columbia SC, Pierre SD, Nashville TN, Austin TX, Salt Lake City UT, Montpelier VT, Richmond VA, Olympia WA, Charleston WV, Madison WI, Cheyenne WY. Try Our Payroll Calculators - all states - it's free.